SAN JOSE, CA--(Marketwired - Feb 19, 2015) - Cypress Semiconductor Corp. (NASDAQ: CY) and Arrow Electronics today announced the PSoC® Pioneer Challenge: Maker Faire™ Edition, a global design competition that gives engineers the opportunity to prototype new devices for the Internet of Things. The do-it-yourself contest leverages the PSoC 4 BLE Pioneer Kit, a new, easy-to-use Bluetooth® Low Energy-enabled development board from Cypress. The winner will be awarded a $2,500 prize to cover travel expenses to the Maker Faire Bay Area in San Mateo, California this spring, where he or she will showcase the winning design. The runner-up will receive $450 worth of gift certificates to buy materials from Cypress, Arrow and Maker Media -- the host of the Maker Faire. Contest entries will be accepted through 11:59 p.m. Pacific Time on Monday, March 23, 2015, and judged based on the ingenuity and potential of the design, as well as the use of the board and accompanying software. Finalists will be selected by the online reader community of Make, Make Media's publication for the maker community, and the winners will be selected by a panel of judges, including representatives from Cypress, Arrow and the editorial staff of Make. "Partnering with Arrow and Make on the PSoC Pioneer Challenge will spark creative and innovative ideas to illustrate how the Internet of Things can add real value to daily life, as we are already seeing with home automation, lighting and wearable electronics," said John Weil, Vice President of Marketing in Cypress's Programmable Systems Division. "The combination of PSoC's hallmark flexibility, the ease-of-use of our PSoC 4 BLE Pioneer kit, and the ingenuity of the do-it-yourself Make community are sure to result in truly unique and dynamic designs." "The PSoC Pioneer Challenge fits in well with Arrow's focus on providing a broad range of Internet of Things building blocks to enable products that improve lives around the world," said Chakib Loucif, Vice President of Americas Components for Arrow Electronics. "Working together with Cypress and Make Magazine will help drive this competition with the maker community that represents the heart of IoT innovation." Cypress's PSoC 4 BLE Bluetooth® Low Energy solution enables complete systems by integrating a Bluetooth Smart radio, a high-performance 32-bit ARM® Cortex™-M0 core with ultra-low-power modes, programmable analog blocks, and Cypress's industry-leading CapSense® capacitive touch-sensing functionality. This combination of technology delivers unmatched system value for Bluetooth Smart products, with prolonged battery life, customizable sensing capabilities, and sleek, intuitive user interfaces. PSoC 4 BLE delivers unprecedented ease-of-use and integration in a customizable solution for IoT applications, home automation, healthcare equipment, sports and fitness monitors, and other wearable smart devices. The solutions also has an on-chip balun that simplifies antenna design while reducing board size and system cost. Designers looking to create Bluetooth Smart products currently must use software tools from multiple vendors and develop complex firmware to meet wireless specifications. Cypress has simplified the Bluetooth Low Energy protocol stack and profile configuration into a new royalty-free, GUI-based BLE Component -- a free embedded IC within PSoC represented by an icon -- that can be dragged and dropped into designs using Cypress's PSoC Creator™ integrated design environment (IDE). PSoC Creator enables complete system design in a single tool, slashing time-to-market. Alternatively, users of Eclipse® and other ARM-based tools can customize their own Bluetooth Low Energy solutions on PSoC Creator and export the design to their preferred IDE. Cypress, the Cypress logo, PSoC, CapSense and TrueTouch are registered trademarks and PSoC Creator is a trademark of Cypress Semiconductor Corp. All other trademarks are property of their owners. 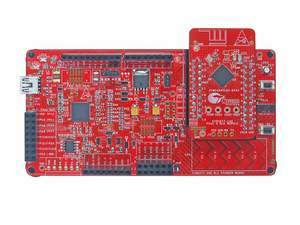 Pictured is the PSoC 4 BLE Pioneer Kit, an easy-to-use Bluetooth Low Energy-enabled development board from Cypress. This video provides a demonstration of the easy-to-use PSoC 4 Bluetooth Low Energy Pioneer Kit from Cypress, which is ideal for Internet of Things designs.